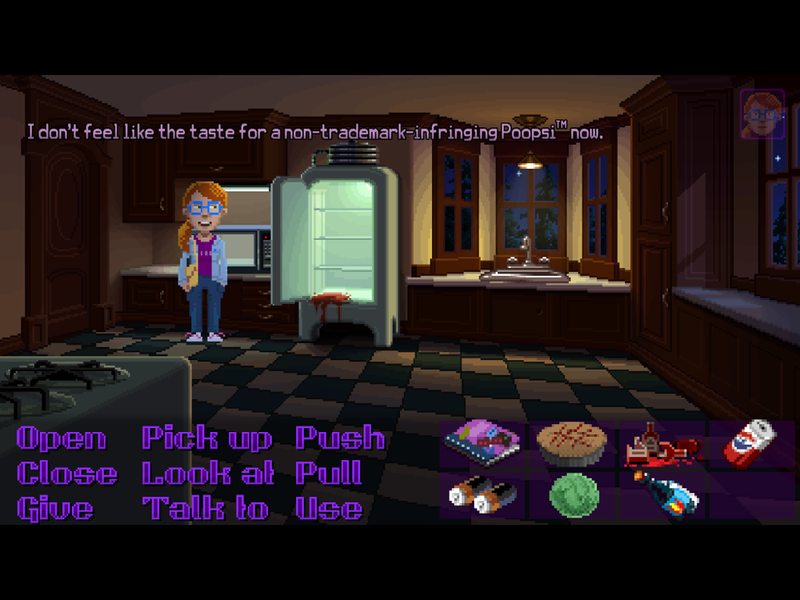 As a point-and-click adventure fan, I knew I was supposed to be excited about Thimbleweed Park when it was announced, but I’d be lying if I didn’t say I had mixed feelings. As I mentioned here, I didn’t grow up on LucasArts games, but rather those like Broken Sword. So I don’t have any nostalgic attachment to the retro art or old school action verb controls. On the contrary, I saw that list of verbs covering a third of the screen and part of me dreaded playing the game. So I’m happy to report that I was pleasantly surprised by both the controls and the entire game as a whole. Yes, it looks like it could have been made in 1987 where the game takes place, but it has most certainly been optimized to be user-friendly to modern audiences. And it turned out to be one of the most entertaining point-and-click adventures I’ve played. It starts off with you playing a man who’s trying to meet up with someone to show them his prototype for a pillow that turns into a stuffed animal. Shortly after, you’ll find yourself dead, the only hint to your murder being two glowing red eyes in the shadows. Two X-Files-esque FBI agents named Ray and Reyes show up to investigate your death, only now you’re playing as them. This should give you a pretty good idea of the kind of game you’re in for. It’s one that breaks the fourth wall at every opportunity and rarely takes itself seriously. You have control over agents Ray and Reyes individually and you swap between them by selecting their icons in the upper right drop-down menu. Early on, there isn’t much difference between the two. They share a to-do list, which tells you what they each need to accomplish at the moment, and you can mostly stick to using just one of them, occasionally swapping items between them. For instance, you need to take a photo of the body, but one of them has the camera and the other has the film. This is how the game teaches you that they can give items to each other. 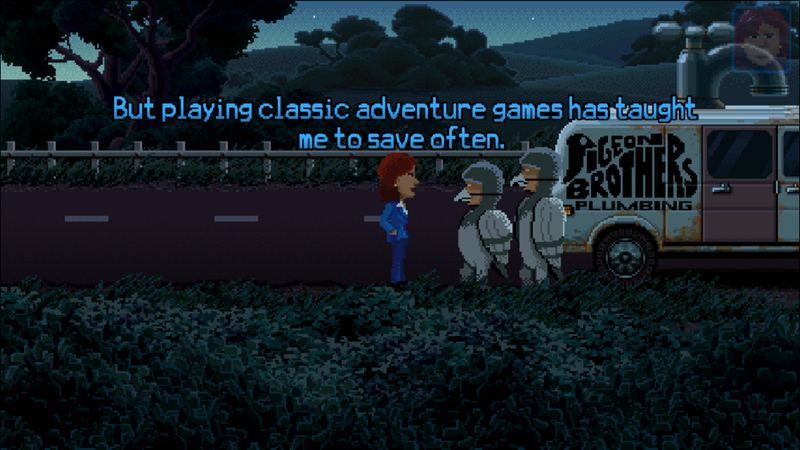 But as you progress, you’ll learn that they each have their own reasons for being in Thimbleweed Park and you’ll need to have them work together on some puzzles so they can achieve their goals. Later, you’ll even gain control over other characters until you have a total of five, all sharing some goals but also each with their individual missions. Again, they’ll have to work together, as certain characters have access to areas that others don’t. Also, FBI agents can do things that others can’t. You’ll have to think creatively, as running around trying different objects with other items will only get you so far. For the most part, the game does a good job easing you into things by slowly giving you access to new areas so you don’t have too much to explore at once. But things can get a bit overwhelming once you unlock all five characters and have the entire map available to you. 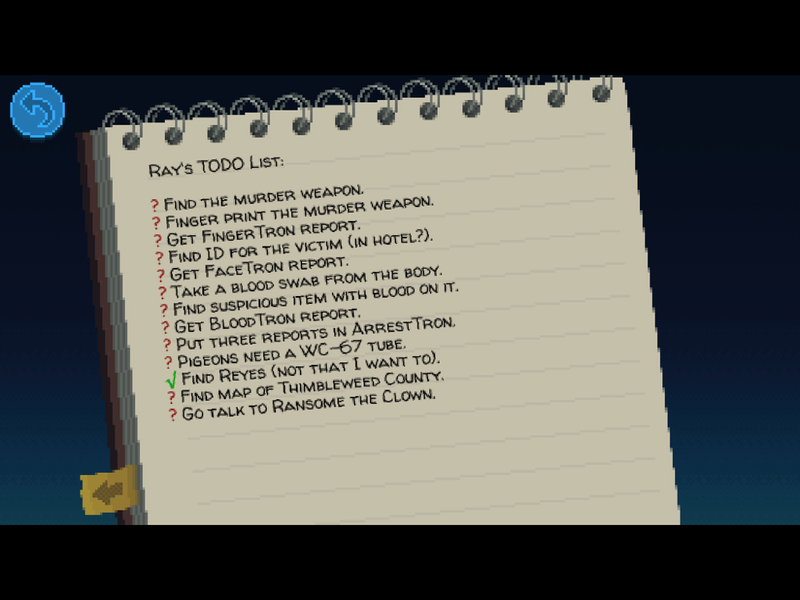 The puzzles and story get more interesting, no doubt, and the to-do lists help you keep track of what you need to accomplish, but not always. They might be too vague or ask you to do something you can’t yet. Each of the five characters has their own inventory, and it can get to be a bit much at times to juggle between all of them without knowing precisely what your next goal is. I sometimes found myself working on a puzzle that I couldn’t finish yet because I needed to solve a seemingly unrelated one first. Still, the puzzles rarely — if ever — felt unfair or illogical once I solved them. On the contrary, an action or item that seemed inconsequential early on often paid off later. And so many puzzles left me smiling when I solved them, due to their sheer cleverness. If, for some reason, you prefer to solve fewer puzzles and just get through the story as quickly as possible, there is an easy mode that removes many of them. I suggest playing the full game in all its glory, though, so you don’t miss out. You’re probably better off using in-game hints and still seeing the puzzles and their solutions than skipping them altogether. The two agents are the least interesting of the characters, with my favorite being the young aspiring game developer, Delores. 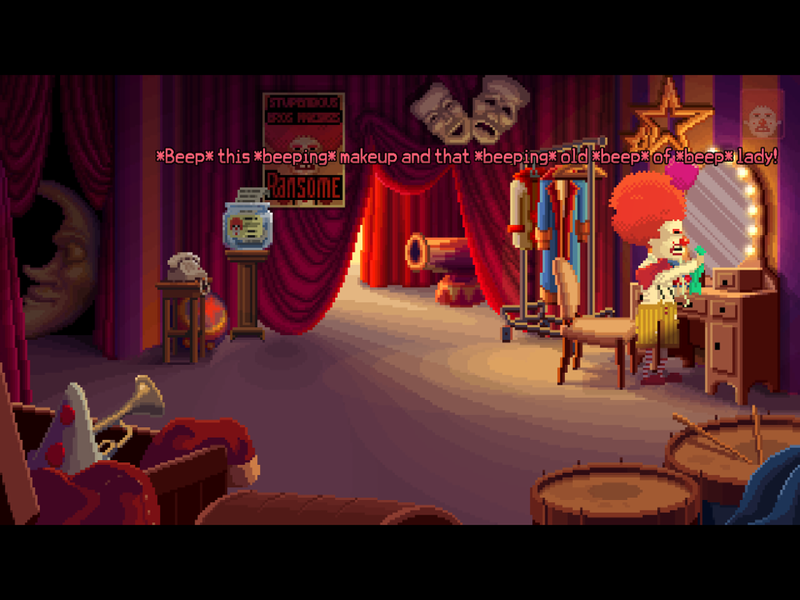 There’s also Ransome the *beep*ing clown and a surprise character that’s more fun to discover for yourself, assuming you avoided spoilers so far. Then, of course, there’s the huge cast of non-playable characters (NPCs). There are some pretty weird ones, like the Pigeon Bros. plumbers who wear pigeon costumes and deal with the supernatural on the side. Or the radio station host who plays the same song all day every day. Or the mailman who thinks of himself as a hero for getting people’s packages to them safely. All the characters are fully voice acted to bring them to life and fully immerse you in the game. Some of them have mildly irritating voices, but I think that’s intentional to add to the humor. I suggest taking your time with the game and just messing around to see what happens when you have the characters talk to each other or how they each react to different objects. You can even rename one of the shops, which I thought was a really cool touch. And if you go into the settings, there’s options to include inside jokes or turn the toilet paper rolls over to the correct side. There are also Kickstarter backer rewards in the the form of phone messages and book excerpts in the library. If you listen to and read them all, you might be playing the game for eternity. It’s pretty mind-boggling how much they fit into this game, and these little details show the love that went into it. There are even specks of dust to collect, which will likely drive certain people crazy since there’s no limit to them. So if you’re stuck on a puzzle, there’s usually something else you can find to occupy your time in the game while you figure it out. Let’s talk about the pixel art style a bit. It’s clearly meant to mimic the look of 1987 games, such as Ron Gilbert’s Maniac Mansion. Again, since I don’t have any nostalgia for the game, the artwork didn’t grab me at first. Especially those hokey oversized heads. But I fell in love when I started noticing certain details. I touched upon it here, but the game often puts the camera perspective behind something in the room. For instance, in the coroner’s office, you’re viewing the scene behind a cadaver, so there are two big green feet between you and the agents. In the sheriff’s office, you’re seeing everything from behind a box of donuts. This gives the scenes more depth but also a ton of character. I found myself looking out for these details throughout the game. Since I mentioned the touch controls here and even laid them out in detail here, I won’t say much on them now. But they rarely got in my way and I even learned to appreciate the old school verbs, as they allowed for more interesting puzzles than simply tapping on items. I still wouldn’t have minded the ability to drag items to each other instead of tapping on “Use,” then on an item, and then on another item. But it’s not enough of an issue in the grand scheme of things. Most actions were streamlined pretty well for touch screens. The introduction of fast travel once you unlock the full map is a huge help and minimizes tedious walking. There’s also a good number of save slots so you can save at different points in the game that you’d like to return to. My only real complaints with the iOS version are that it’s not full screen on iPad and that there’s no iCloud sync. I was stuck playing the game at home for the bigger screen and would have liked to be able to work on some puzzles on my iPhone while away from home. Also, it means unless you’re on iOS 11, you can’t delete the game from your device until you’re sure you’re 100% done with it and don’t want to go back anymore and look for anything you missed. I’m purposely avoiding talking about the plot, as it’s hard to do so without spoiling it. In fact, it’s hard to really talk about my favorite parts of the story, puzzles that stood out to me, and what makes it so special without ruining the fun of discovery for others. It’s part murder mystery, but there’s so much more to it. And the real fun of the game is uncovering all the little details. I will say I have mixed feelings about the ending, and I think probably a lot of people will. It’s one of those instances where it’s more about the journey. I had a blast playing the game, but the more I think about it, the more certain things bother me. They weren’t enough to negate all the fun I had with it, but part of me kind of wishes it had a more satisfying ending. Overall, I thoroughly enjoyed my time spent in the strange town of Thimbleweed Park. The game is very cheeky, so don’t go in expecting a deep and moving story. It’s here to tell jokes, even self-deprecating ones. Thimbleweed even makes fun of video game logic while sometimes using it itself. It’s also very much a love letter to point-and-click adventures. Those who grew up with LucasArts games will appreciate it the most, but any fans of the genre should still have a great time. Even though I didn’t come to it with much knowledge of Ron Gilbert’s earlier games, I still smirked at those jokes and was able to understand the jabs at adventure games in general. I don’t know that it will get me to play those older games, as I still find old school controls annoying, but maybe others with more patience will seek them out. 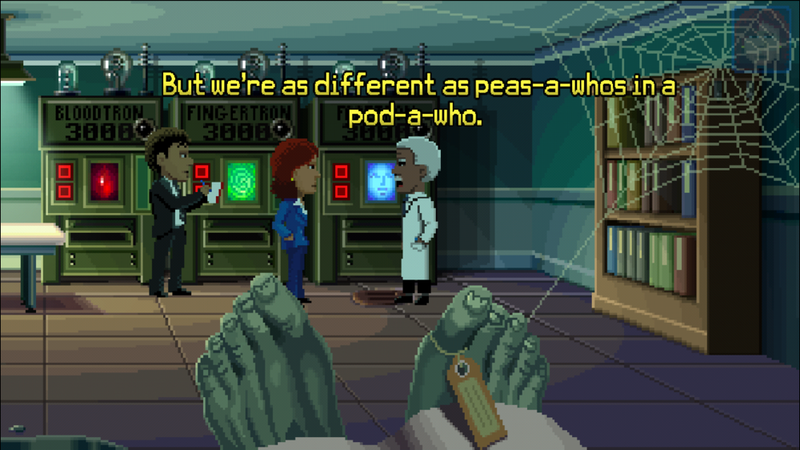 Bottom line is, if you’re a fan of point-and-click adventure games, Thimbleweed Park is a must-have, and the iOS port is a great way to experience it, especially if you have an iPad and hate playing games on a PC as much as I do. It’s a hefty game, too, as it took me about fifteen in-game hours to complete it. If you’re itching for a solid point-and-click adventure, grab the game here and just enjoy the insanity. I didn’t write a walkthrough since it had already been out for so long on PC by the time it came to iOS. Are you sure you found all the items on the highway? Ah. Well, I think the iOS game is different from the PC version. I think I found everything on the highway but I’ll look again, thanks. I keep picking up specks of dust, lol. No idea why. I did find a w/t on Steam and some videos on youtube. I’ll figure it out eventually and just play on PC if I have to. P.S. I am into the last chapter of Returner 77. Some of the puzzles are unique – at least I never saw them before. Happy Monday! Darn – I already had the dime – duh – I missed seeing the arrow in inventory. I hadn’t played in a while since I was playing Returner 77 and started Blackwell Legacy.